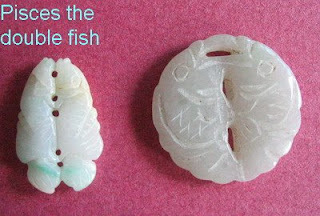 Well, these jade fishes are more likely to have come fom some boulder in some mountain than from the sea. I got this catch from a market, a flea market that is. Fish represents wealth and prosperity because the Chinese term for the fish, yu, is phonetically similar to the word for 'abundance'. It has been a favouredChinese design from neolithic times to the present day. The ones shown here are of some 10-50 years vintage. 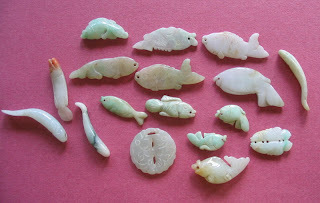 Jade is a delightful medium for imitating nature. My set of fishes comes in all shapes, cuts and carvings. Some are flat, some in swimming pose, with curving tail, pouting mouth. 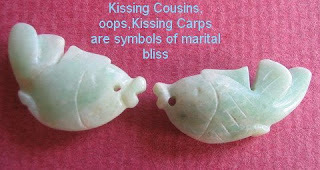 The twin fishes or double fishes are symbolic of marital bliss but in present day coinage, it may represent the zodiac sign Pisces. 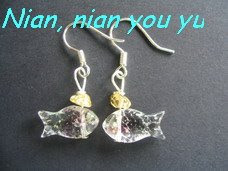 And not forgetting my beautiful auspicious nian nian you yu (every year have fish) earrings.